A Russian volcano network that warned airliners winging over the North Pacific of potential hazards went silent March 1 due to budget cuts, increasing the risk that aircraft could enter undetected ash clouds and experience sudden catastrophic engine failure during a trans-ocean flight. Without alerts issued by the Kamchatkan Volcanic Eruption Response Team, jetliners flying between North America and Asia could get little or no warning if any of the 29 active volcanoes on the Kamchatka Peninsula erupt and send ash clouds roiling into air traffic lanes, particularly during bad weather or other conditions where satellite coverage was unable to pinpoint the plume. 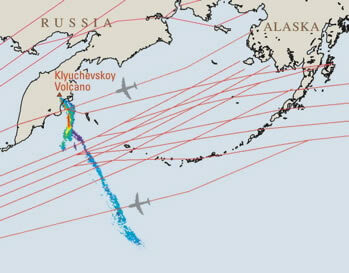 Satellite data alone is insufficient to always catch an eruption before an ash cloud becomes a hazard to planes. This unfortunate event comes at a time when three volcanoes in Kamchatka are at Color Code Orange and intermittently producing ash. The volcanoes produce ash that threatens air traffic lanes three or four times every year.